TPC Overall Rank: #226 out of 2933 rides. User Tracker Count: 407 times. 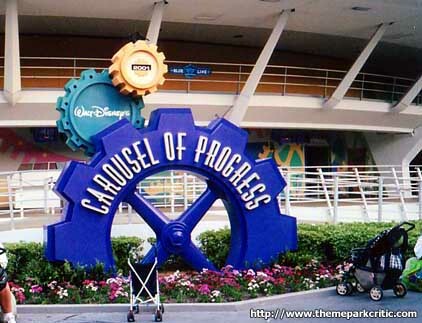 This is a ride that needs to be preserved walt disney himself created this ride its an amazing innovative idea and you cant forget the past as we head into a great beautiful tomorrow...i will never not go on this ride its not a thrill but its a disney classic! Lovely relaxing ride - perfect when you've had enough of queuing and want a break. lovely!! I guess I'm in the minority here because I didn't find this to be a great show. In fact I was kind of bored with the show itself. Maybe it wasn't just my style. What I liked most about the presentation is the actual rotating theatre from scene to scene. That in itself makes this worth a one time visit. But if you take the rotating theatre out and just focus on the show, to me it was just kind of meh. Worth doing once but it certainly wouldn't draw me back to it. A wonderful ride. The story was very interesting and the different appliances, etc were fascinating. The last scene needs a bit of help since it's a bit laughable as is, but the rest of the ride is fine. Children may unfortunately be unprepared for the show and thusly bored, but adults or those with a good appreciation of history will enjoy this attraction immensely. One of my all time favorite attractions. I&#39.ve read that this ride is Walt&#39.s favorite as well. It was his last attraction. This ride should be protected as a historical landmark. 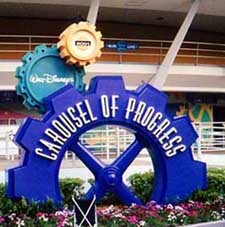 Carousel of Progress was first shown by Walt Disney at the Worlds Fair in New York City in 1964. The show chronicles "progress" from the turn of the century to... what is it... sometime in the early 80s? Its quite interesting and the animatronics are good for its time although not as smoothly animated as some of the animatronics in some of the newer attractions (think Buzz Lightyear or Stitch). Its a good ride to sit through after spending a couple of hours in a hot park. The song is catchy too. Its worth seeing at least once. Just so you know, the kids may find it a bit boring. But who cares? They can take a nap. Its good for its time although a bit dated. I give this show an 8 out of 10. I really like the song although i never even meat to go on it, i was looking for buzz lightyear! "Theres a great big beutiful tommorow". That statement is right if this ride is burning down tomorrow.